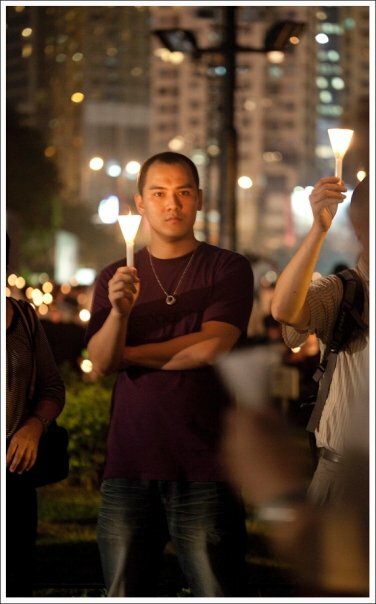 Communist Beijing can’t Black out Hong kong’s 180K Candles! 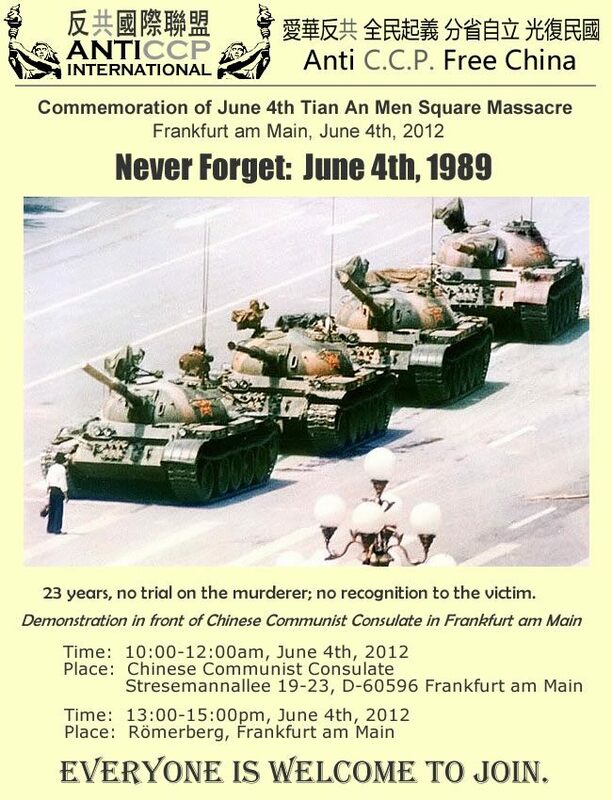 6’4 Tiananmen Student Massacre! Free Liu Xiaobo 劉曉波 and all political prisoners! 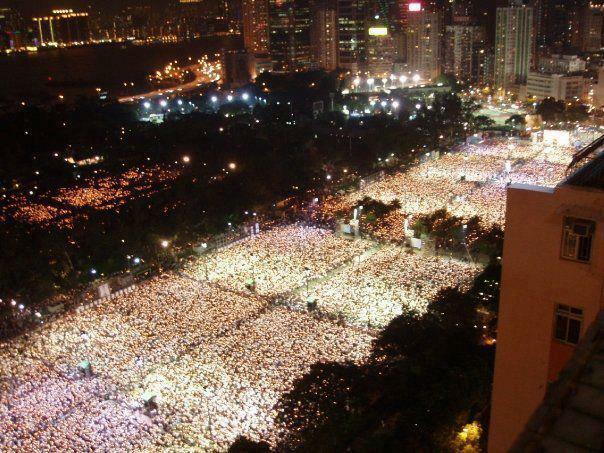 This annual event in Hong kong’s Victoria Park is way beyond explanation in its 23 rd year! If you need it explained, chances are you are from Mainland China where the Communist Ministry of Propaganda has been blacking out all images of Tank man online! If that is the case, fear not, there are 800milliion like you in Southern China who found a way to celebrate with Hong kong! You are ALL welcomed to our Annual Candlelight Vigil. This year 2012, it was huge! Come and see the photos ! Celebrate Creative Free speech in Hong kong! Lets hear it for Hope and Freedom! Hong kong Welcomes your Creative FREE SPEECH!! What does this tell you? We never “F O R G E T”!! Then at Free Liu Xiaobo’s, PEN got news that Beijing had banned all journalists AND beaten up a group of people trying to host a peaceful rememberance event at Tiananmen! Why is that? Because we Use Our Conscience in Hong kong! HONG KONG, PARQUE DE VICTORIA. El 4 de junio de 2012. ¡Se cumplen 23 AÑOS ! ¡SOMOS ANÓNIMOS, NO PERDONAMOS, NO OLVIDAMOS. SOMOS 7 MILLONES EN HONG KONG y 80 MILLONES EN EL MOVIMIENTO QUE EJERCE NUESTRA CONCIENCIA CONTRA LA DICTADURA COMUNISTA. LIBEREMOS A LIU XIAOBO Y A TODOS LOS PRISIONEROS POLÍTICOS! ¡NO PUEDEN NEGAR LA EXISTENCIA DEL 4 DE JUNIO DE 1989! ¡SOMOS TODO EL HOMBRE DE TANQUE! Translated by Gervasio Orellana, Chile with thanks from the http://www.facebook.com/free.liu group! 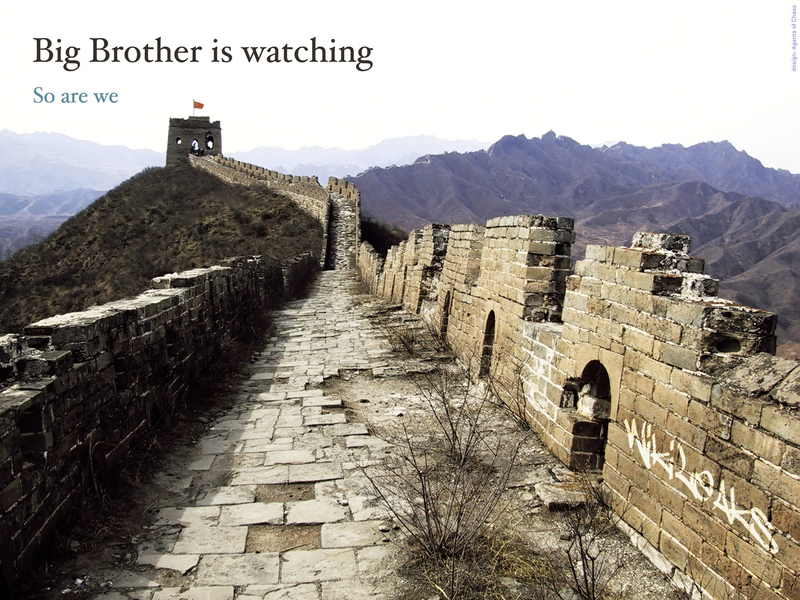 Let US NEVER EVER Let them use the GREAT Firewall of China to Deny what Tank Man did all those years ago!!!!!!! 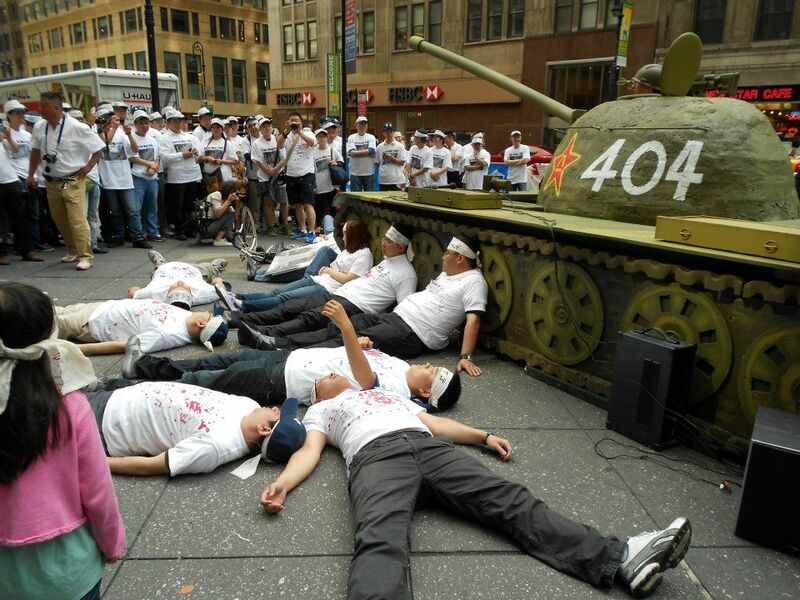 WE ARE ALL TANK MAN!!!!!! AND FINALLY, What can you do? These are the lists of “SENSITIVE WORDS” CCP Communist Chinese Party has paid Millions to “Black out” on the internet! 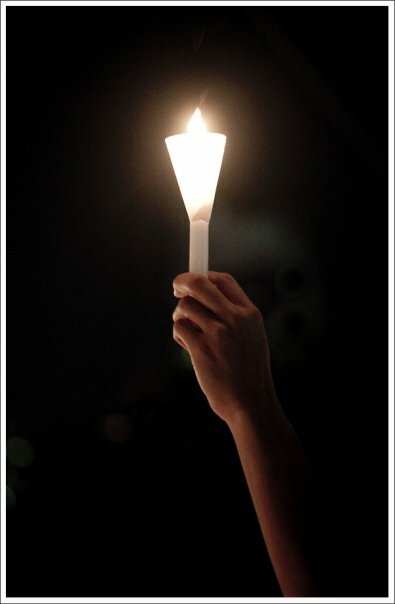 candle (烛): as in [wax] candle (蜡烛), candlelight (烛光); Sina Weibo removed the candle emoticon over the weekend. 8, 8 (八), eight (捌), eight: All forms of “eight” and other forms of the numbers below. 23, 23 (廿三), 23 (二十三): Today is the 23rd anniversary of the massacre. 35, 35 (三十五): Netizens call today May 35th to get around the censors. today (今天): searching for today’s date. that year (那年): netizen code for 1989.
commemorate (纪念): commemorate 6.4 [as Tiananmen is frequently referred to] (纪念六四), Heroes Monument (英雄纪念碑), etc. 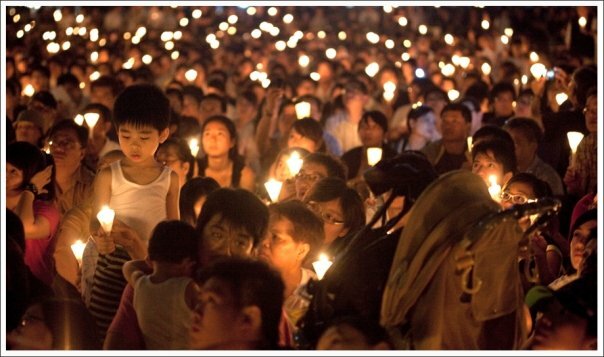 Victoria Park (维园): An annual candlelight vigil is held in Hong Kong’s Victoria Park to remember the Tiananmen massacre. 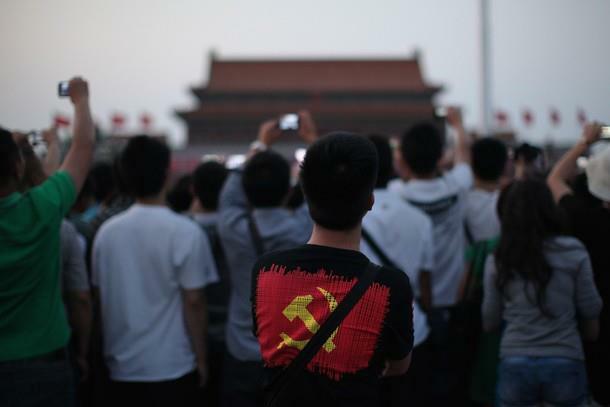 black clothes (黑衣): Netizens called for people to walk in the streets wearing black clothes to remember Tiananmen. 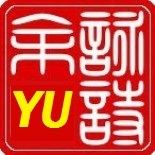 Twitter (推特): Chinese-language tweets tend to be democracy activists. 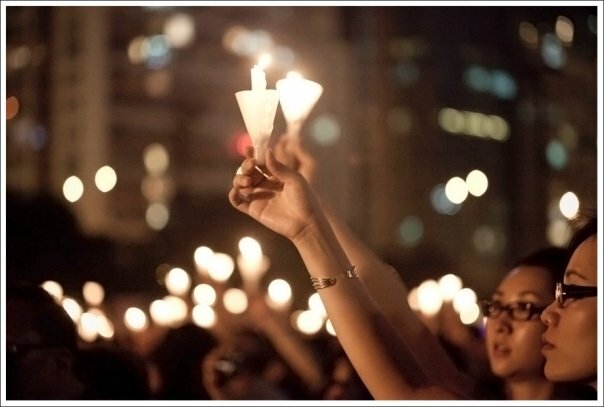 During sensitive times, many share information about gatherings. Bei Dao 北岛: On the eve of the Tiananmen Massacre, poet Bei Dao submitted a plea for political reform to the central government. Yuan Mu (袁木): Former State Council Information Office spokesman and apologist for the regime. In April 1989 he spoke with 45 students in 16 high schools. Chen Xitong (陈希同): then-mayor of Beijing. He recently said Tiananmen was an avoidable tragedy. The four listed above were all ordered under arrest by the Ministry of Public Security. Music for Hong Kong & Cantonese readers: 🙂 We are the Conscience of 1.3 BILLION because WE CAN! 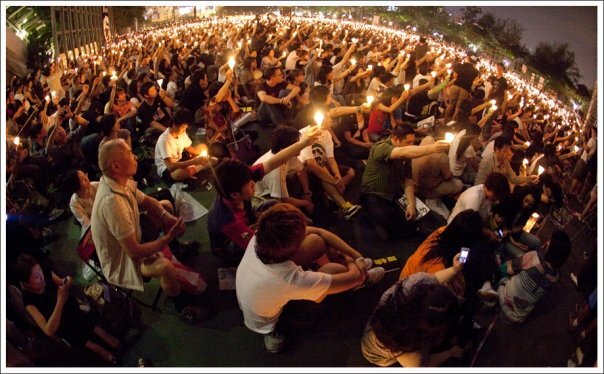 Between the 4th June-11th June 2012, in a simple 21K Free Liu Group Images of Hong kong’s 180K protest and the suspicious death of Li Wang yang generated 509,208 Viewers Worldwide!!!!!!!!!! To tell the truth it was a wonderful detailed post nevertheless like all great writers there are some points that could be worked pm. Nevertheless in no way does it detract from the particular greatmess of your work, though maybe some blogs could be dozed out in a smaller amount…..the whole was very stimulating. Very interesting in the topics you have mentioned , regards for writing . 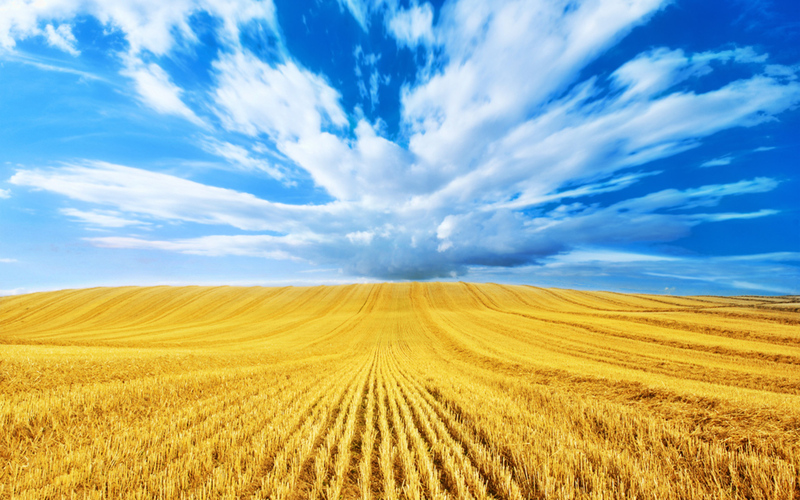 Leaving a quote for thought: “You can tell the ideas of a nation by it’s advertisements.” by Douglas South Wind. How can I have updates of recent blogs from my blog being automatically posted on my Twitter? Marillas, there is a button in your dashboard for that….I can’t remember where…just look around…I think it is in settings….just email “wordpress support” straight away if you are experiencing problems. Don’t bother with the “helpers” …they just go blah-blah online…like most chatrooms and never get to the point …blind leading the blind! I never believe the crap morons say in chatrooms, it is not helpful. If you would like to get updates from this then you will understand why we have to apply such methods to our strategies and know that your support is hard-won and we appreciate the info on your website about us. Hello Sydney Sun Roof Repairs, lol. Okay, I’m hoping it is “WACA WACA” as in http://au.linkedin.com/pub/samantha-castro/1a/a76/796 and NOT “WAKA WAKA”… bomb some bloody slum in Uganda ‘cos we can’t afford the ticket to South Africa (sooo annoying…nearly killed off Kenny the himbo (project guy in uganda)…hahhaa….Chi SEEN! Hate exploitative football except Barcelona FC, (they are in my goodbook cos they extended the contract with Yala and their players have cute accents), Love Shakira, Empower Africa from the Grassroot and stop listening to Euro-trashes ideas of what Africa needs! Chi Seen! Honestly, even WITH Shakira, I still think football is Zzz! There is definitely a lot to learn about this subject. I love all of the points you have made about the bravery in defiance of censorship. Greetings! This is my 1st comment here so I just wanted to give a quick shout out and say I really enjoy reading your posts about anti-government protest in Chinaa. 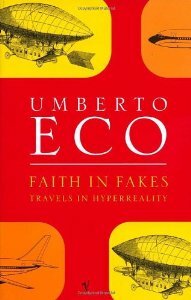 Can you suggest any other blogs/websites/forums that go over the same subjects? Thanks a lot! Make sure you click on Older posts button on the left bottom corner so that you can see more of it…there’s about 2yrs worth of materials about it. Hope you enjoy it. 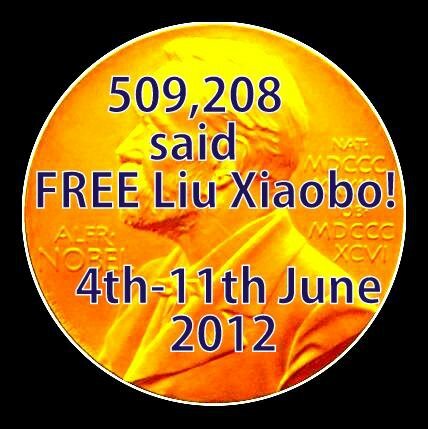 Free China’s Nobel Peace laureate Liu Xiaobo! Due Process is the Main Challenges In the chinese legal professional leading this generation – What You Need To Know is that we cannot have due process if we have no freedom to think! From Cecilia: Tsing, I know. I’m sorry. Hong kong supports you. 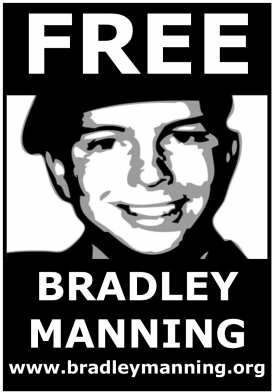 Thank you for supporting Bradley Manning! SERIOUSLY!!! There is no mail through the white rabbit hole that Alice knows of! P.S It is 5.30am gmt….surely this is not THE URGENT thing?!!!???? Zzzzzzzzzz. You r lucky my kitten woke me up meowing cos he had his balls off this week! Lol. HAPPY NEW YEAR? What time is it in the southern hem? You know those Sydney lawyers didn’t get Bradley out right? Hello from Turkey. My blog is Trafikte Sorumluluk Hareketi. Nice we meet. You have some friends from turkey who can read this? From Cecilia: yes, I do. I am sure they will like your blog, they are constantly complaining about dangerous drivers in Istanbul! Goodluck! I think other website owners should take this website as an model, very clean and above reproach in terms of integrity . hey I can read french too! LOL. Word from the wise Francois de La Rochefoucauld. A very decent web site , I love the style. It really stands out! Do you have a writing team or just you? I was talking about wikipedia…some chinese guy keeps trying to quote from wikipedia to claim Li Wang Yang could have killed himself! Thanks for taking the time , I feel strongly about this. If possible, as you gain facts, let me know. I will revisit but I won’t follow because when you click the follow button on someone’s profile, you start following them and will be constantly updated on the tweets that are being posted by the one being followed. That won’t go down well for me all the time. But you know how to flag me to important topics…and lets see about getting you on wiki. Some really nice and utilitarian stuff on this website, the design and style has got excellent features. You wanna quote? Better dead than Red! Best Regards for helping out, wonderful info. You asked us to leavea quote so here’s one by Will Durant: The health of nations is more important than the wealth of nations. Utterly cool content, thanks for information. “No human thing is of serious importance.” by Plato….but this is very close to it! I hope it works out for the people. I do consider all the ideas in your post. They’re very convincing. The posts are very pointed for novices to the topic. Can you give me some background from previous time? Thank you. I wanted to get guidance from someone with experience with design. Any help would be enormously appreciated! this is a shocking post. What a brave man to stand up to the tanks! This entry was posted on June 5, 2012 by ceciliawyu in International Advocacy & Trends, Nobel Peace Prize & human rights and tagged Beijing China, Candles, ceciliawyu.wordpress.com, communism, communist chinesedictatorship, Democracy, democracy in China, Democracy Now, Democratic elections China, Hong kong, LA DICTADURA COMUNISTA. 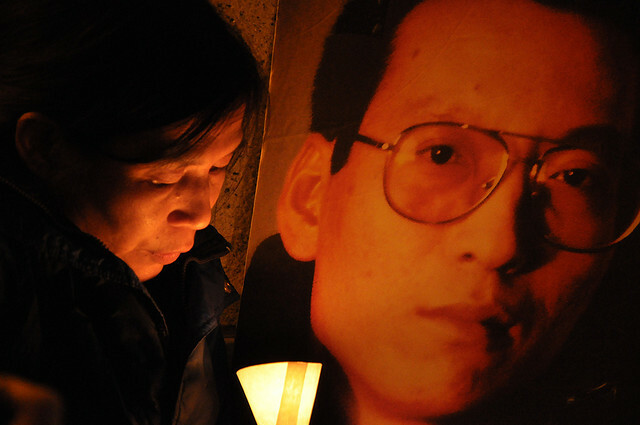 POR LA MATANZA DE TIANANMEN, LIBEREMOS A LIU XIAOBO Y A TODOS LOS PRISIONEROS POLÍTICOS!, protest china, Tank man, Tiananmen, tiananmen candlight vigil, Tiananmen student massacre, Victoria Park, 劉曉波.